A life-long horsewoman, Rosemary Wyndham-Jones, is a natural horse-friendship trainer, an EAGALA Facilitator (Equine Specialist), an EPONAQUEST Riding Focused Instructor and an Holistic Horse and Hoof-care Professional. Alongside her fourteen strong herd of horses she studies the dynamics and relational development of the horse/human connection. 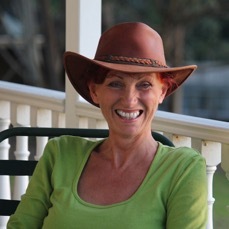 She has a warm, accepting and welcoming presence, an encouraging, relaxed style of coaching and her intuitive understanding and knowledge of horses is impressive. Rosemary is the owner and founder of Dune Lakes Lodge, a Retreat and Horse Inspired Learning Centre on the North West Coast of Auckland, New Zealand. She co-founded Equine Pathfinders Foundation, a charitable organisation established to make equine assisted growth and learning accessible to everyone. For over a decade Rosemary and the herd have trained international corporate companies, adu lts from all backgrounds, including at-risk women, adolescents, young offenders and troubled youth. Her main love is running five day residential Kids Camps for children from all walks of life. Rosemary utilises the concepts of human psychology and instinctual horse herd behaviour to provide powerful life-learning experiences that both heal and empower. The physical and psychological ‘join-up’ between clients and horses enables the former to draw metaphors relating to everyday life outside the arena, and thus learn and develop a greater sense of self knowledge and well-being. karate, practices yoga, and rides horses to maintain her own sense of balance and fitness. She loves her life with horses and creating opportunities for people to experience their magic and gain benefit from their wisdom. JODIE – of a horse who changed my life. Born in a stable on the Isle of Wight, UK in 1990, Jodie was a spirited filly who grew to become unpredictable and with a lot of attitude. Despite a lifetime of experience with horses I was unable to understand how to deal with Jodie; sending her to conventional trainers only worsened her behaviour. Thankfully, a serendipitous meeting with a lady named Mel Richards transformed my despair to hope. Mel’s natural horse womanship skills made a deep impression as she ‘danced’ with her horse at the Natural Horse ……….Centre in Sussex. Leaving my ten acre farm (IOW) I drove Jodie and her mother, Mary to Mel’s establishment in Wales where I lived and breathed natural horseman-womanship for six months. Through this life changing experience I gained insight, not only into Jodie’s behaviour and needs but clarified my own future pathway towards achieving my true vocation and goals. In 2003 I emigrated to New Zealand and set up Dune Lakes Horse Inspired Learning Centre on the South Kaipara Peninsular in 2005. Only a one hour drive from the centre of Auckland, the beautiful 100 year old villa sits in 37 acres of rolling grassland, adjacent to Lake Kereta and 3kms from miles and miles of sandy beach. For me – a paradise I share with 14 horses, 2 dogs, 4 cats, a deer, 2 sheep, ducks, hens and wild peacocks – and a Yurt (Mongolian tent) lovingly constructed from a eucalyptus tree rescued from a friend’s garden after a storm. Above all, an equine paradise to share with friends and people seeking to overcome life’s challenges and deal with what’s not working in their lives. For all this I give thanks everyday! Check Rosemary and the herd of two- and four-legged facilitators out at the Dune Lakes Lodge website.